Do you know about Nature’s Notebook? It’s a program of the National Phenology Network where citizen scientists record details about birds, trees, mammals, amphibians, reptiles, butterflies and moths to help scientists create long-term datasets about changes to populations and timing. The species the organization is currently tracking are not all inclusive of every species you may see, but it’s a fairly long list. I currently have just under 100 species I’m reporting on, but you can pick as many or as few as you like. Phenology is the study of when things happen in nature, the seasonal changes that occur every year. For instance, I know that the leaf fall in my forest is about two weeks later in the year than it was 20 years ago because I keep track of the dates. Lest you think I’m totally OCD, for years the only television reception I had was a satellite dish that only worked once the leaves fell in the fall. I knew when to expect to see TV again, and I soon realized it happened a day or two later just about every year. Tools like e-Bird made it easy to see changes in the arrival and departure dates of bird species I see around my cabin. For Nature’s Notebook, the questions asked about each sighting are more extensive than for those in e-Bird, and the questions vary somewhat with each species. You can submit your sightings online by computer or through an app that’s available for i-Phone and Android users. 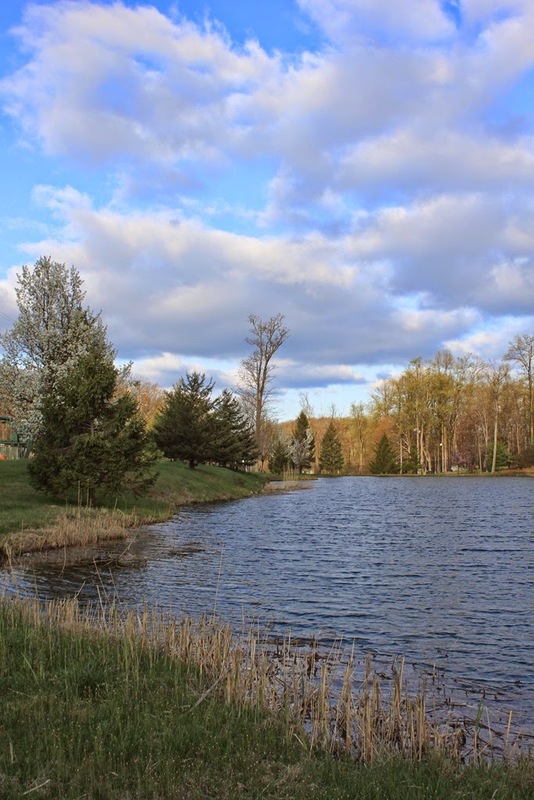 The organization has about 50 partnering groups that range from nature centers to student groups and professional organizations. Sponsoring agencies include the National Park Service, The U.S. Geological Service, NASA, NOAA among others. The only downside I can see is that I haven’t yet figured out if I can enter my data from previous years. One project I’m participating in is about red oaks. 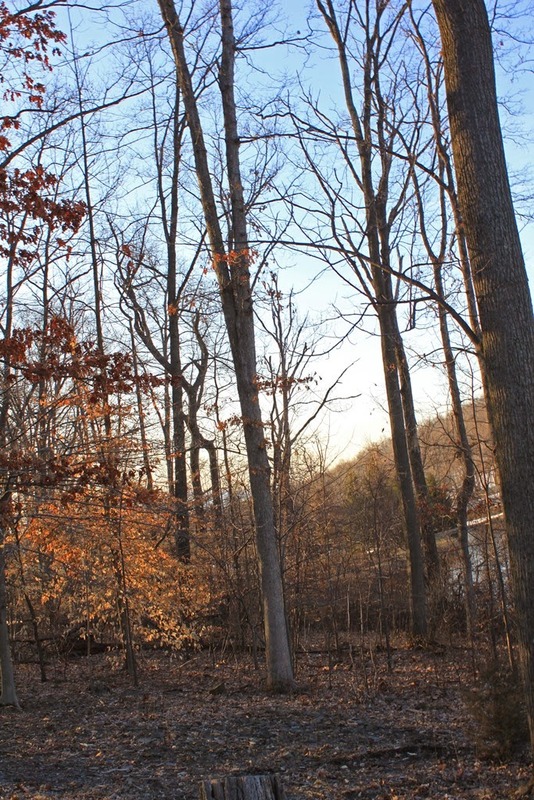 My observations will note when the first leaf buds appear, the number of them I see, when the first actual leaves appear, when the leaves are full size, when they turn color and when they fall. Some publications and educator tools are available for free download to help explain particulars and help with botany. They also have tools, some only in a beta version currently, that let you see the arrival of spring, for example, across the U.S. Anyway, if such things interest you, I invite you to check it out and see if it’s something you would enjoy participating in. 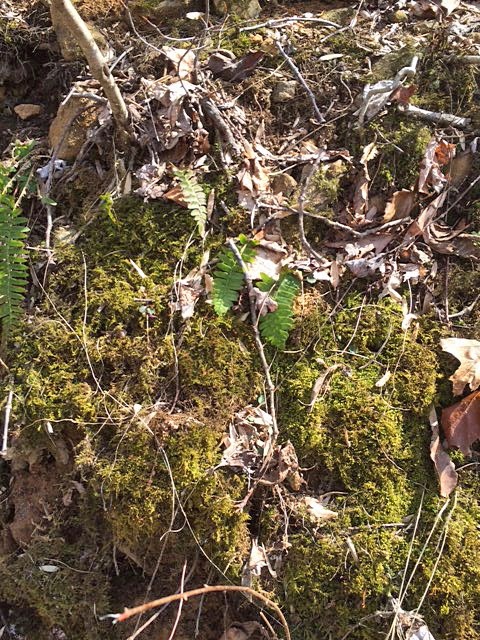 As if the budding trees and blooming wildflowers weren’t enough, I can tell it’s spring by the amount of sounds in the forest around my cabin. 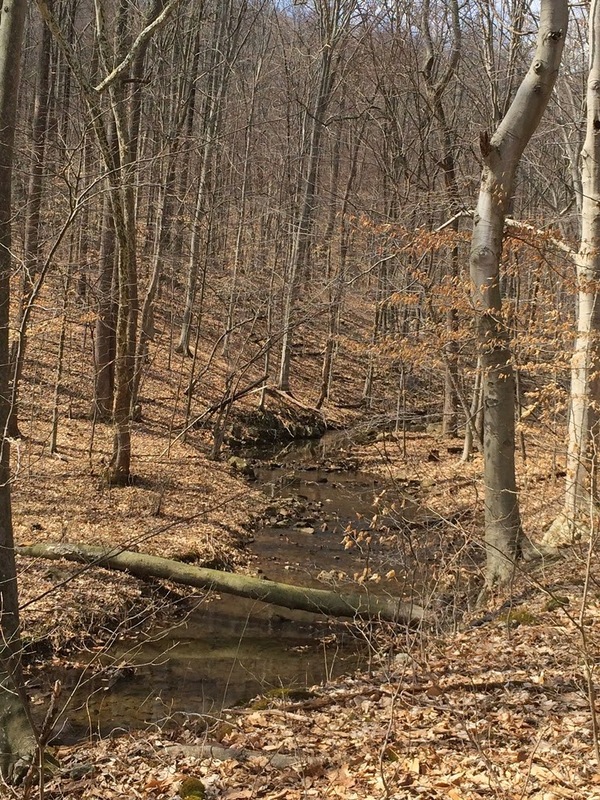 The sound of wild turkeys gobbling, the sound of a fox barking, the call of the phoebes and Carolina wrens, the rush of wind through the trees—all of this is quite a change from the quiet of winter. For some reason I’m still not used to all the spring sounds yet. The season sounds noisy to me. Or perhaps it’s only that I can no longer filter out sounds the way I used to, the way I imagine people who live in cities do. Or even towns. It’s hard to hear the forest for all the noise going on inside it right now. And it will only get louder as more of the summer resident birds arrive and start singing for a mate. In winter the sounds of even a quiet footfall or a distant limb breaking and falling somewhere let me know what’s going on around these woods. But now I hear so many other things that I can’t hear those more distant or quiet sounds anymore. I suppose this happens every spring, but for some reason I’m noticing it more this year. Every spring some things are different, even in the same forest. This year the rue anemone are thicker than I’ve ever seen them . The forest across from my cabin is so thick with them that I don’t dare walk over there, as I could not avoid stepping on them. There must be hundreds of plants, looking almost like little cotton balls strewn across the forest floor. 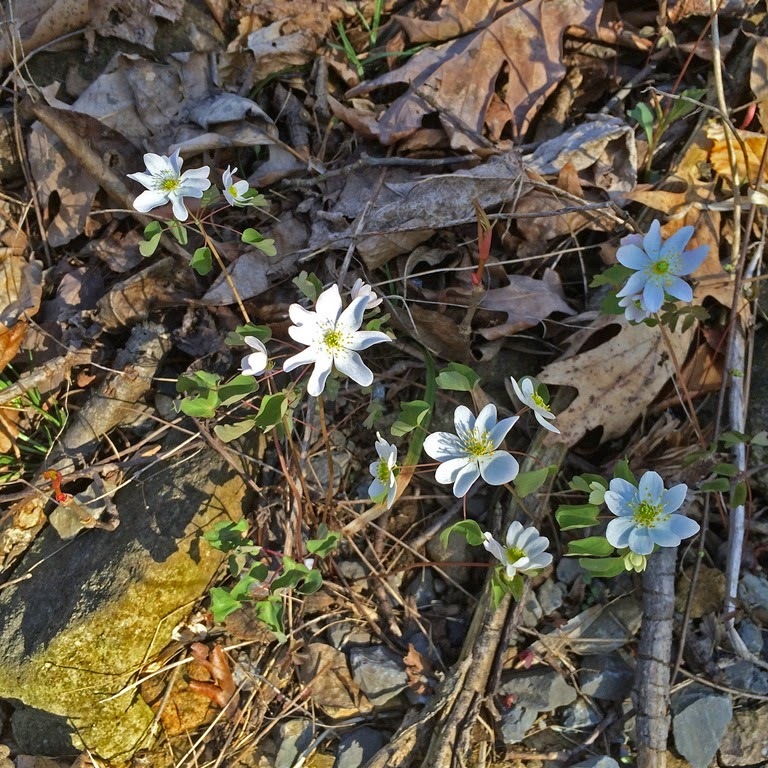 And yet, I didn’t have any bloodroot this spring, and I found only a few hepatica plants. 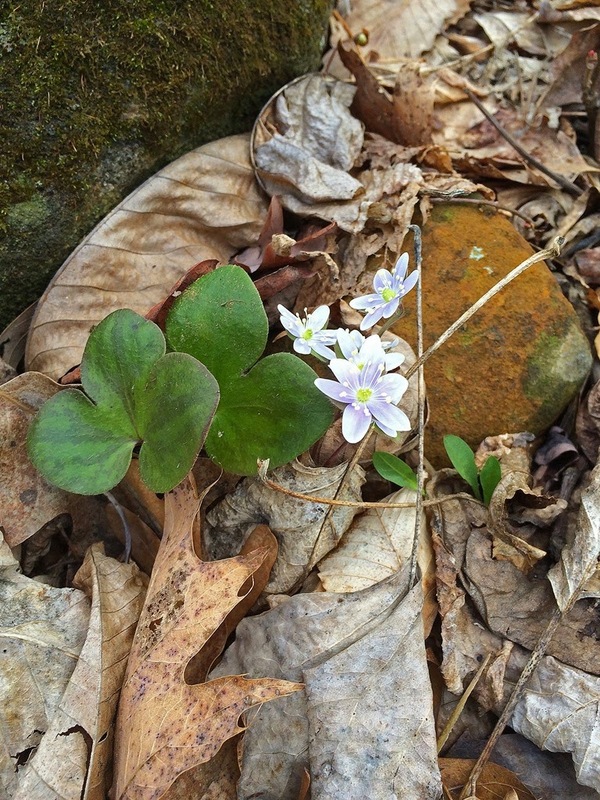 Already the trout lilies are done blooming, and the leaves of the purple violets are just appearing. The forest is ever-changing, season by season and year by year. Even in the same place. April is the cruelest month, and this April is crueler than most. Snow flurries! I had snow flurries this morning before sunrise. And temperatures solidly below freezing. Just when it looked as though spring had finally arrived, another blast of near-winter makes me drag out my winter jacket again. Yes, I know the photo is deceptive. It looks like a pretty spring morning, not one with skim ice in the puddles and bone-chilling wind gusts. The trees have that fuzzy look they get before the leaves pop out. I think the leaves might be wishing they were still hiding in their warm, cozy buds for the next few days. I rather feel the same way. I pity the poor barn swallows that arrived a few days ago. I can’t believe they will be very successful finding mosquitos for a while. It’s hard for people in this part of the country to wrap their heads around the fact that 96% of our earth experienced a much warmer than average winter. In fact the winter was the warmest on record worldwide. You can read about that here: http://www.weather.com/science/environment/news/warmest-winter-on-record-earth. There’s a nice global map that shows the eastern half of the U.S. as the earth’s only cold region. Aren’t we just the lucky ones? But here, in the cold spot of the world, winter just won’t let go. The chickens are on lockdown for the moment, and officially they are Not Happy. At 4:30 a.m. this morning I was awakened by the sound of a barking red fox—the first I’ve heard in months. It sounded as though the fox was in my driveway. An hour or so later when Baby Dog and I were taking our morning walk, I heard the barking again, this time more distantly. I will let the chickens out this evening when I get home, so they can be outside for a few hours until dusk. Foxes are usually active at night, though sometimes are seen during the day. It’s those early morning and early evening hours that are the most critical, but with the fox prowling so close to the cabin, I’m not going to take any chances for a while. This probably also means I won’t get any unbroken eggs for a while. The girls have taken to laying their eggs in the old chicken coop that I don’t use any longer but which I haven’t gotten rid of yet. Instead of laying eggs in their own coop’s nest boxes, they have decided to sleep in those cozy little nooks. So if they are forced to lay there today, I imagine the eggs will get broken before I get home. 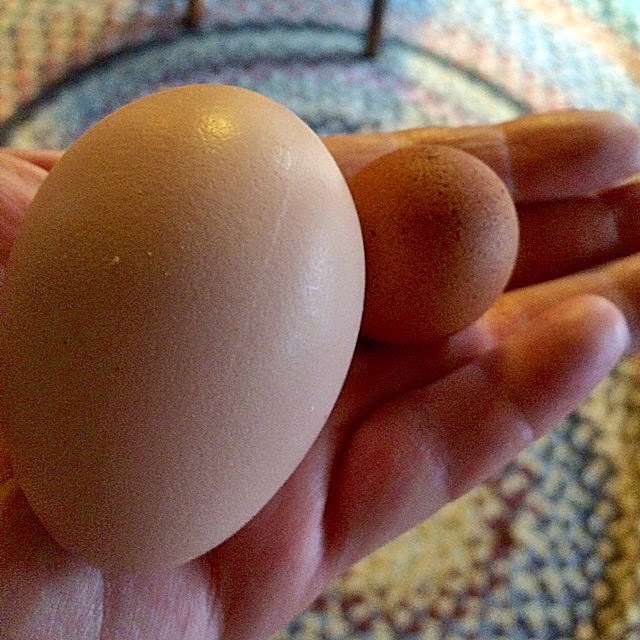 In other chicken news, one of my girls laid a fairy egg a day or so ago. It’s the first one I’ve ever had. Fairy eggs, also called witch eggs, happen occasionally. Usually it’s when a hen is interrupted in her laying process for a day. It might have even been the day Baby Dog scared one of the hens when the two met unexpectedly at the corner of the cabin. Fairy eggs won’t have a yolk, so this one will get tossed out, but it’s still kind of interesting to see. 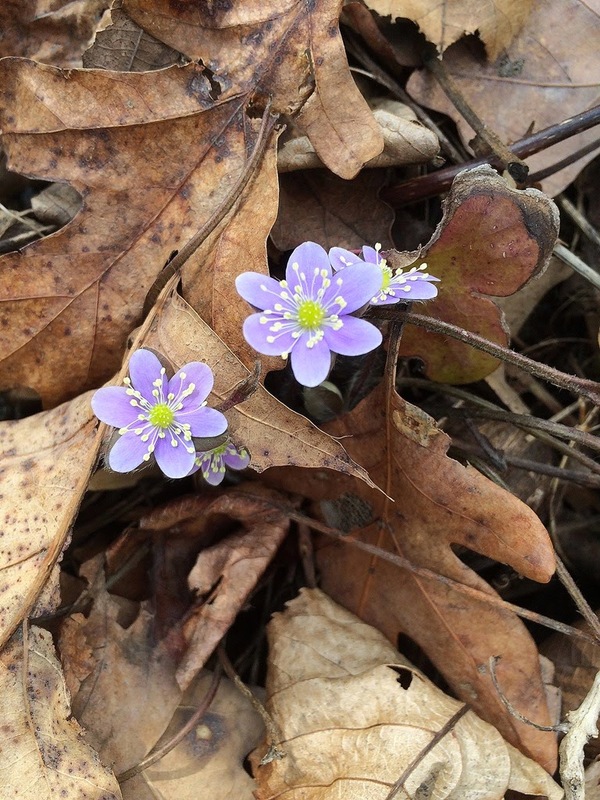 Spring ephemerals are blooming all around my cabin this week. Out! They all popped all at once. They are such tiny and dainty little things. I have to look for them, watching underfoot so I don’t accidentally step on one. Friends who aren’t flower people tell me when they see my photos, “I’ve never seen anything like that.” I think it’s because they expect the flowers to be large and showy, as sometimes the close-up photos make them appear. These are not your mother’s tulips. These are half-inch jewels that are easily overlooked, despite their colors. Many of them close up at night and only reopen when the sun wakes them up again, and in a week or two they are gone, gone for another year. They aren’t always easy to see or easy to find. That’s part of what makes them so special and so spectacular in their own tiny little way. 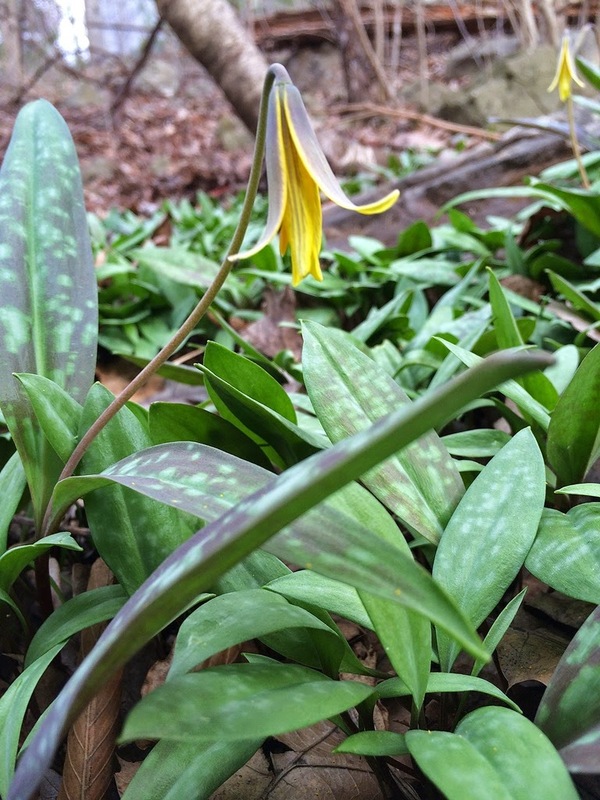 The dog-toothed violets, aka trout lilies, are starting to open up! 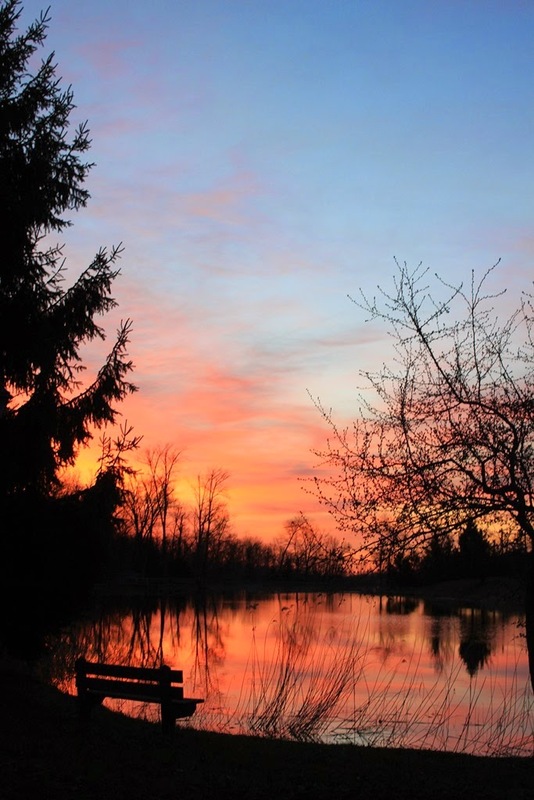 Here’s an oddity for you—a red sky (sailor take warning) in the morning with nary a forecast of poor weather nor a thing on the radar. Is this the exception that proves the rule? I can’t remember the last time a lovely red sky like the one this morning didn’t mean poor weather ahead. Okay, so rain might be coming my way on Friday, but that’s too far ahead to count, I think. And there could be rain on the radar about 110 miles south of me, but I don’t think that counts either. Typically a red sky morning means rain within 24 hours and usually within 12 hours. Today, this sky doesn’t seem to mean anything except that clouds at the horizon turned a lovely shade of red this morning at sunrise. 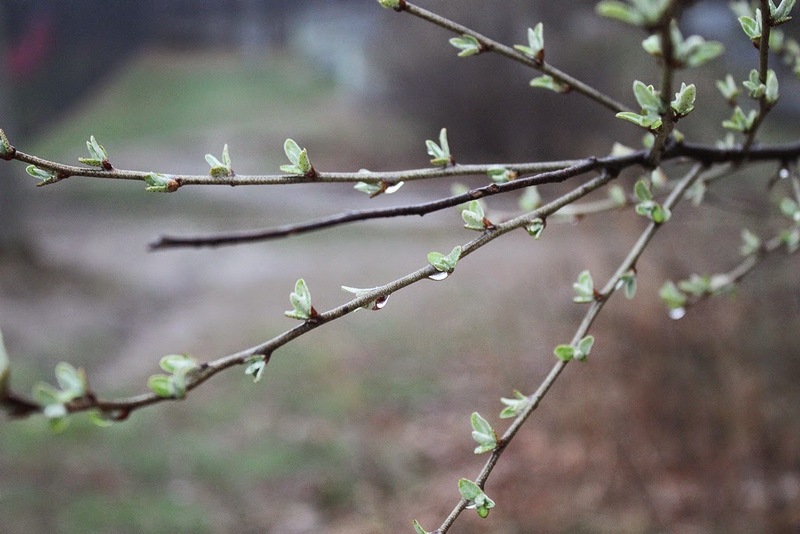 A gentle spring rain and the season’s new growth erupts. I swear I can see the difference from morning to night. Until today’s rain, the spring here has been somewhat dry. This rain is all that’s needed to encourage shy growth to explode all at once. Today’s rain was so gentle, it wasn’t much more than a mist, the kind of rain where I could walk all morning without a rain jacket and still not be soaked. The dogs didn’t even bother to shake after their morning walks, and the chickens didn’t look askance when they ventured out into it. The moment when the trout lilies/dog-toothed violets bloom is nearly here. The gorgeous, green and gray mottled leaves are already visible, covering a 4x5 area of the ground just outside my cabin door. As of this morning, no flowers were yet blooming, but it won’t be long. The yellow flowers aren’t visible for more than a few days or a week. Tomorrow rain is predicted, so if I don’t have the first flowers by this evening, I won’t expect to see any before Wednesday. 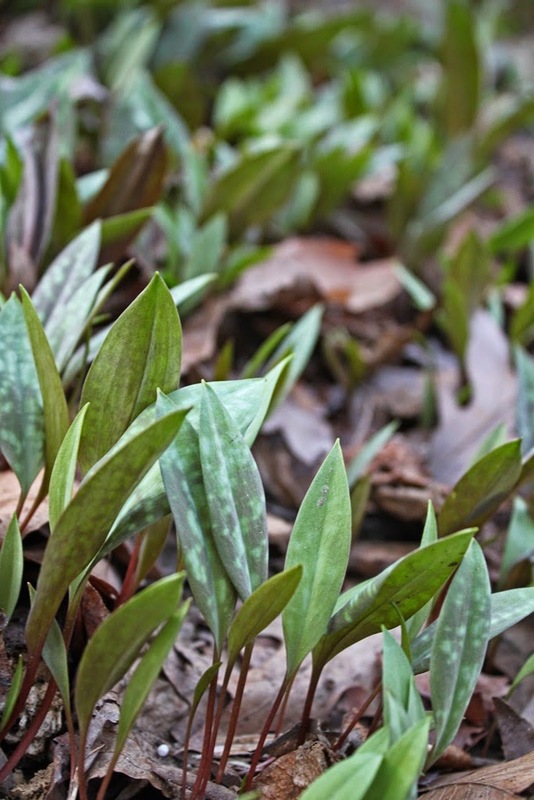 The trout lilies are usually in a race with hepatica and bloodroot as to which will bloom first. 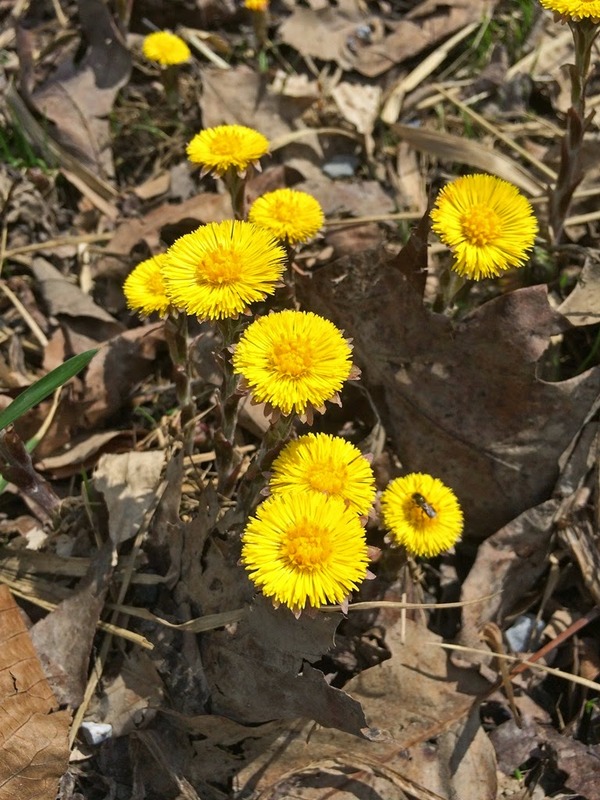 Winter affects the timing of these blooms. The first ones can appear anytime from March 23 to April 25. One good thing about blog labels is that I can easily find when the first blooms appeared in previous years. As you can see, the bloom dates are all over the April map, with a warm March thrown in for good measure. On a completely different note, this past weekend I’ve been enjoying the sounds of birds both before dawn and after dark. The gobbling of wild turkeys has awakened me for several mornings now. I’ve yet to see these large birds, even though the gobbling sounds close enough that if it was daylight, I should be able to see them. Also, great horned owls have been calling from somewhere up near the top of the mountain. Their calling is too far away for me to expect to see them. More phoebes have arrived, and their calls start before dawn’s light, too. The deep silence of a winter’s morning is no more. 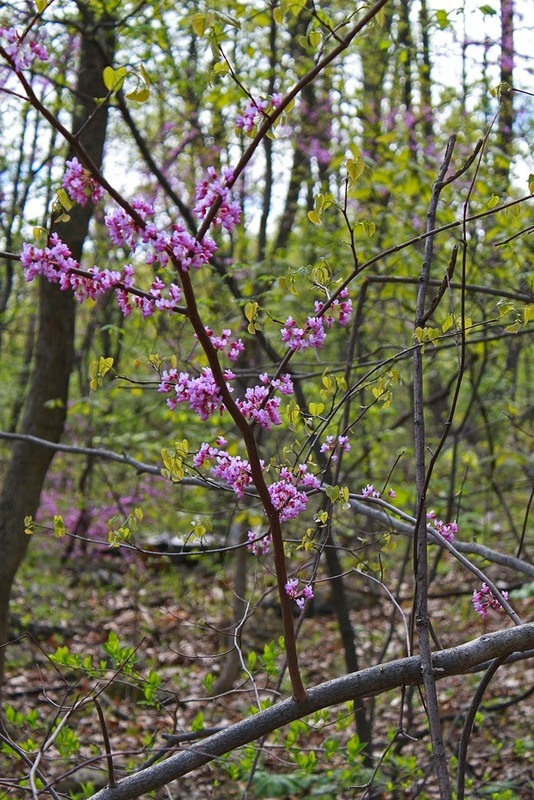 Already a few hesitant buds are appearing in the forest around my cabin. Likely, more would be in evidence with the first sunny day. This week hasn’t produced even a moment of sunshine, just a constant drizzle, and, as you can see, a lot of fog. Not much actual rain has fallen, though given the amount of mud around the forest, you might have guessed differently. Last night the fog was so thick and gray that it actually made my bedroom seem light. I kept waking up wondering if Roundtop left some lights on, or perhaps the neighbors. 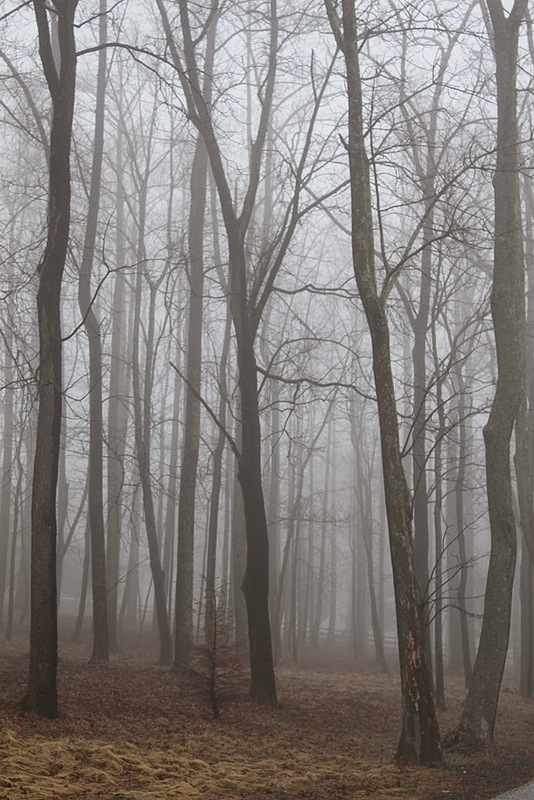 But no, the gray color of the fog just made the night paler than the usual dark of the forest that I’m used to. I suppose I could have gotten up and closed the curtains, but I don’t think I woke up enough to do that. Or didn’t want to wake up enough do that. This morning during my walk I heard more than I saw in the forest around me. Sometimes I could identify what I heard, sometimes it was only a noise in the woods, and often that was enough to spook one of the dogs. We almost walked right up to a pair of geese and startled two deer bedded down under a small spruce tree. Even they were nonplussed by the fog, I think. During the past winter I spent so much time shoveling that I had little time to enjoy the winter or the forest I live in. So I hadn’t been down to the bottom of Roundtop Mtn. and the little Beaver Creek that runs through the valley since the start of 2015 and probably not since early December. This weekend the weather cooperated, the day was sunny and near 60, so down I went. 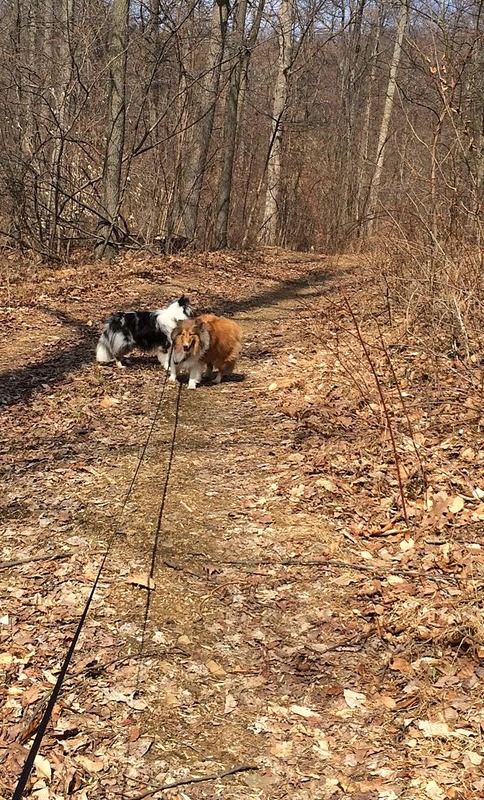 I took Skye and Sparrow with me, as neither has had much chance to spend time in the woods with me or go on longer hikes. They are still young, not much over a year, before winter set in I thought a longer walk might still be too much for them. I really wasn’t expecting that I’d be able to walk the length of the valley. I expected to find mud and soft ground in the road, as I have in years past But the spring rains haven’t really taken off yet, and the snow melted 10 days or so ago, and I found the old woods road in better shape and drier than I anticipated. The puppies were ready for an adventure, and spent much of the walk down the mountain chasing and jumping on top of each other. Down along the creek, I discovered the little creek running full and fast, a far cry from the near-still and shallow version of itself during the last weeks of adventure camp. Down here, spring has not yet sprung. 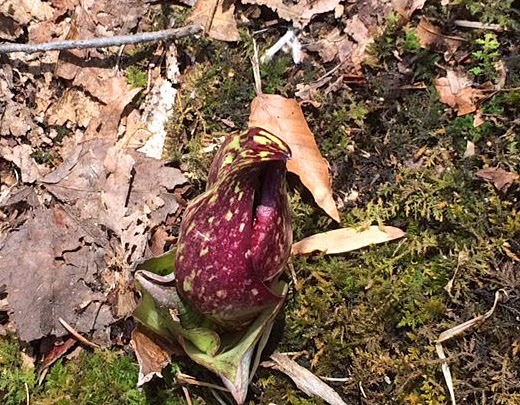 I found exactly one skunk cabbage plant and that just 2-3 inches above the ground. Even the moss hasn’t greened up yet. Most of the Christmas ferns have finally lost their green shade, and the few that are left no longer look very festive. The puppies paid more attention to each other than what was going on around them, I’m afraid. They did venture down to the creek’s edge for a drink of creek water, but nothing else held their attention or their interest for long. They certainly loved the run, though. On the way back, their little tails dragged a bit, as they haven’t learned not to use up all their energy at once. They still have a lot of learning to do. The woods at Roundtop are the quietest they will be all year. Once the leaves come out, it is a rare moment when the wind is still enough to keep them from whispering. The leaves sometimes seem to rustle on their own, when no wind is perceptible. It’s only when the trees are bare of leaves and the wind is still that the silence is this deep. In midwinter, I can usually hear the sounds from the ski resort, though that is never loud. The sounds I hear then might come from a lift or a few teenagers yelling back and forth or perhaps just a lift operator banging his snow shovel against the concrete at the bottom of his lift. I hardly think about those sounds—until they disappear entirely. So now the night is utterly quiet, unless a dog barks across the valley or the great horned owl hoots or the geese over on the big pond are fussing about something. I can stand still for minutes at a time and not hear a single sound. It’s a lovely time, a lovely thing to experience. It never lasts long enough to suit me, so I enjoy every precious second before the silences slips away and is hidden inside the sounds of the forest.